that are very eager to learn. The Swedish vallhund is an ancient breed, originating from the Viking Age. In the early 1940's, they were almost extinct. 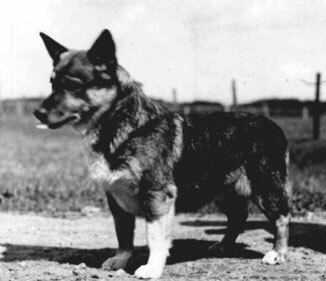 Thanks to the efforts of the Swedish mr Zettersten and mr Von Rosen, the breed was bred back from a small group of dogs. In 1943, the breed was recognized by the Swedish Kennel Club and in 1953 the breed was given its present name, Västgötaspets. 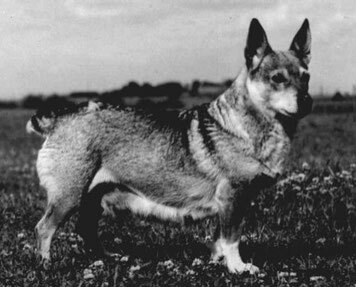 The first Swedish vallhund entered The Netherlands in 1977 or 1978. 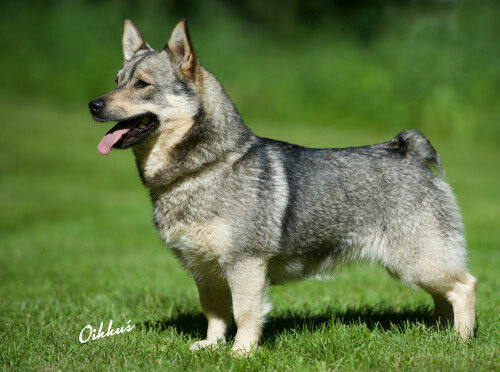 Below, two of the first Swedish Vallhunds that were registrated in Sweden, the female Topsy and male Mopsen. The västgötaspets is an energetic, alert and watchful little dog. It's strong and fearless, but also responsive, charming and with a large dose of humor. Swedish vallhunds are intelligent and learn quickly and willingly. For centuries, they were general farmers dogs and used for herding the cows (heelers). Nowadays, they still are real working dogs and often being trained for all kind of dog sports, like agility, obedience, tracking and herding sheep. Being a herding dog, he loves to be close to his owner(s), but can be a bit reserved towards strangers. Almost all Vallhunds are very social to other dogs. The dogs are small and sturdily built with short legs. The height at the withers is 31-33 cm. The ratio of height to length of the body is 2:3, the weight 9-15 kg. Part of the puppies are born without a tail or with a short tail. Formerly, the tails were amputated, but because this is no longer allowed, all kinds and lengths of tails can appear. The coat is harsh, short and closed and the colours vary from grey to red(dish) or brown. The breed is generally healthy with many dogs reaching a high age. A full description can be found at the breed standard.